With the third-, fourth-, and fifth-place finishers from last season's Mr. Olympia musclefest scheduled to compete on March 2nd in Columbus, Ohio, the latest version of the Arnold Classic looks—at least on paper—to be one of the deepest contests in recent years. The 12-man lineup also features three former Arnold Classic champions: William Bonac, the defending titlist; Cedric McMillan, who took the crown one year earlier; and Victor Martinez, the 45-year-old veteran from New York who topped the field in 2007. Despite leaving the venue with the first-place prize of $130,000 in his pocket last year, Bonac is not a clear-cut favorite to make back-to-back wins based on the slated competition. Still, the 36-year-old is terrific. At 5 feet, 6 inches tall and 230-235 pounds, he packs plenty of Grade A beef to be considered a very difficult opponent at any show he competes in. My 25-year run as the Arnold Classic emcee has come to a close, but after watching so many contests and following their careers, my eyes have been trained to notice the best, and I can't help but put my predictions out there. That said, let's see what we're working with. For my money, the 5-foot-7-inch, 260-pound Roelly (pronounced Rule-ee) Winklaar from Curacao has the most muscle of anybody in the game, set off by filthy arms for starters. Does anybody possess superior guns to this dude? And the rest of his muscle groups aren't exactly lagging. Winklaar's biggest problem over the years has been conditioning, but when he comes in dry, it's bye-bye to his fellow flexers—potentially even Bonac. Bodybuilders are notorious for adding 10 or so pounds to their stage weight, but I've seen Winklaar compete at 275 pounds. He looked leaner last year, hence the lighter poundage listed above. In any case, the guy should be the main model if anybody ever does an updated video on the 1981 Rick James hit, "Super Freak." If he comes in as good at the beginning of the new season as he ended 2018, Winklaar should best the rest. That said, even if the 41-year-old shows up in top shape, his opponents aren't going to roll over and play dead. Bonac and Brandon Curry are capable of taking him out. Bonac, especially, has some added fuel in the fire, called retribution, when he steps onstage for the 31st edition of the contest. The losses to Winklaar in 2018 at the Arnold Australia and the Olympia were close. Bonac will be out to prove he's still the superior bodybuilder. But I won't discount Curry. The 5-foot-8-inch, 235-pounder from Tennessee has the best shape of the three, while Winklaar and Bonac are thicker. Some people had Curry third at last year's Olympia, but I think his fifth-place finish was the right call. Curry has two Arnold Classic titles to his name—South America in 2013 and Australia in 2017. But he won't be satisfied until he nabs the grand prize in Columbus, and I think he's capable of it. So, to make a solid declaration, I have Winklaar as the slight favorite, with both Bonac and Curry also capable of becoming the latest ASC winner. Now, Cedric McMillan may not like reading this. Especially since he won the contest two years ago and usually shows up in Columbus in better shape than he does at the Olympia. This guy has it all—height (6' 2"), weight (270 lbs.) and symmetry to be as good as anybody competing today. But, like the Winklaar of past years, he often comes in lacking the hardness necessary to top the field in high-level shows. McMillan, 41, moved down to third last year in Ohio. I'll put him in my "longshot" category to come out with his second victory in Ohio. Other top six candidates in the field include Josh Lenartowicz, Steve Kuclo, and Victor Martinez. Lenartowicz, the latest "Thunder from Down Under" (Australia, gang! ), is very good. He was third in Columbus in 2016, but after competing seven times that year, the 5-foot-10-inch, 260-pounder was burned out and took time off. Now, with two full off-seasons under his belt, the refreshed version of Lenartowicz could be the X factor in the show. Kuclo was a strong fifth in Columbus last season and ninth at the Olympia, just one spot in front of McMillan. The 6-foot, 260-pound former firefighter from Texas (via Michigan) has plenty of size, and when he comes in spot on, he is another guy who can shake up the final placings. Lionel Beyeke finished sixth last year, but with the depth of this year's field, he may have trouble duplicating that placing in 2019. He's got the goods to be in the top three, with beautiful symmetry on his 5-foot-10-inch, 245-pound frame. But Beyeke has the same issue that McMillan has dealt with over the years: conditioning. I was ready to write off the 5-foot-9-inch, 240-pound Martinez, but if he looks nearly as good onstage as he does in internet videos of late, he will be in the mix for a top six landing. Martinez isn't the oldest guy in the lineup, by the way. That honor goes to Charles "Tank" Dixon, who at 47 years old is moving up from the 212 (the division was eliminated after last season) to take on the younger, bigger fellas in the main event. Dixon's stats go "5 feet, 3 inches and change" and he will probably compete at 200-210 pounds. Filling out the lineup are Luke Sandoe, Akeim Williams, Rafael Brandao, and last year's Arnold Amateur winner, Mikhail Volinkin. Of this group, Williams should have the best shot at knocking the other guys beneath him in the rankings. As always, the Men's Physique category will be an extremely competitive field, as several of the top 10 finishers from last year will return in 2019. This includes Andre Ferguson, the defending champion, runner-up Raymont Edmonds, and third-place finisher Brandon Hendrickson. There will be a new champion crowned in Classic Physique, however, as 2018 winner Breon Ansley is not competing. Second-place finisher Arash Rahbar is also not on the roster, so the battle for the title here is up for grabs. Harold "King Kong" Kelly has been to the Pro Wheelchair division what Lee Haney and Ronnie Coleman were to the Olympia: a dominator. If asked for the safest bet on the long weekend, it's Kelly dominating the field for the fourth consecutive season. 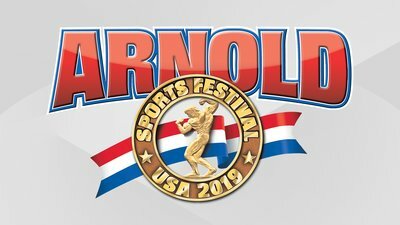 Interested in training like a pro bodybuilder, or like one of the other world-class athletes at the Arnold Fitness Weekend? Sign up for Bodybuilding.com All Access and choose from among 50+ expert-crafted fitness plans.